Living Trusts have the advantage of making funds and assets available more quickly than Wills. The assets included in the trust could be distributed upon your death or if you become disabled. Living Trusts do not have to go through the standard probate process, so funds can be distributed to cover your death expenses or to care for minors or disabled family members. You have assets you want to be distributed quickly upon your death or incapacitation. You have assets you want dispersed privately. You want to appoint a person or professional executor to manage the assets held in the trust. Note: This Trust template is not appropriate for individuals whose estate exceeds the federal estate tax applicable exclusion limit. But this form is suitable for most with an average net worth. Living Trusts are rather simple. Essentially assets are put into a "trust" and you designate a person (trustee) to manage those assets. The trustee could be you while you are alive or another appointed person. You can even designate a paid professional executor to manage the trust. Those who are designated to benefit from the trust are called beneficiaries. Living Trusts avoid the probate proceedings and fees associated with Wills. In some states, the probate proceedings associated with the distribution of assets as outlined in a standard Will could take months. A Living Trust is a way for you to set aside funds for quicker distribution for caring for your minor children, disabled family members, or pets. Assets can also be designated to support you if you become incapacitated and cannot manage your finances yourself. In most cases, Wills become public record once probate begins. Anyone can request copies of your Will easily. If you have certain assets you want to distribute privately, you can use a Living Trust to manage the distribution of assets. If you appoint a professional executor, even your family wouldn't have to know about the Trust or beneficiaries. Revocable Living Trusts are most commonly used. Revocable Trusts are easy to change. Irrevocable Trusts cannot be changed after they are signed. Most often Revocable Trusts turn into Irrevocable Trusts after the trust maker dies. Irrevocable Trusts are frequently only used by those wealthy enough to fund the trust without possibly needing the assets later. The advantage to Irrevocable Trusts is that the assets in the trust are no longer considered part of your personal assets, so the funds are protected. Yes. A Living Trust is just one part of your estate planning. Wills often are used to designate how assets, that are not included in the trust, are to be distributed. Sometimes people don't move all their assets to the trust or obtain properties after the trust is created so they need a way to dictate how those assets are to be disbursed. You can even dictate in your Will that whatever is not included in the Trust to be distributed to a single person. If you do not have a Will alongside your Trust, assets not included in the Trust will be distributed according to state laws. Unlike a Living Trust, the Will must go through probate. Some people choose to make a Pour-Over Will. This type of Will dictates that assets are to be moved into a trust after your death. 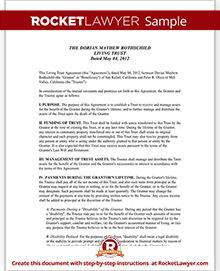 Unlike Living Trusts, Pour-Over Wills still need to go through probate. Your information: Name, city, state and the date the documents will be signed. Possible beneficiaries: Spouse, children's names, non-family members or organizations who may be beneficiaries. You can also make provisions for future children and pets. The form also allows you to designate a pet caregiver. Trustee: Who will be responsible for managing the trust. You'll also want to list a co-trustee or a replacement trustee in case something happens to the original trustee. You also have the option of appointing a professional such as your lawyer or accountant. Also, whether the trustees will be bonded. List of assets: The assets, the value of the assets, and a description of the assets. You can add as many assets as you need to the document. You can also say whether trustees will be sending you payments if you become incapacitated. Distribution: How you want the Trust assets to be distributed. Will you need to set aside monies to pay the trustee? Are the beneficiaries allowed to take loans from the trust? Tangible assets: You can dictate how tangible assets may be distributed such as vehicles, jewelry or household items. Other items to consider: Will the trustee need to provide regular reports? Are trustees allowed to invest funds? Are trustees released from liability if they make a bad investment in good faith? How do you want funds distributed if a beneficiary is no longer able to receive funds? Do you have beneficiaries already assigned to certain assets such as your life insurance? If you have any questions about what's right for your estate plan, we can connect you with a lawyer for quick answers or a document review. If you'd like to read more about Living Trusts and other estate planning essentials, check out our Estate Planning Guide. 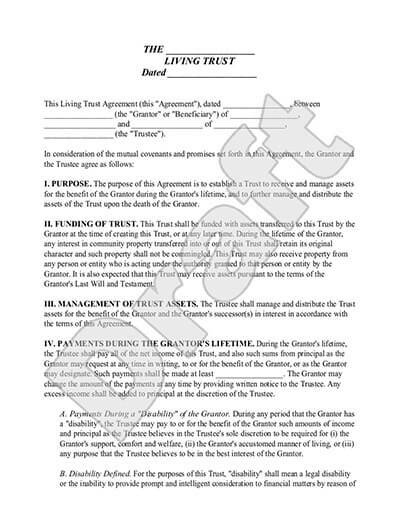 Our step-by-step interview process makes creating a printable Living Trust easy.